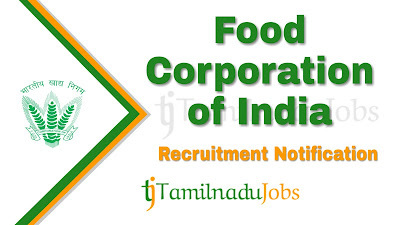 FCI Recruitment 2019: Good news for the Aspirants looking for Central Government jobs, now Food Corporation of India (FCI) published an official notification for 4103 post to fill the JE, AG, Steno and Typist, work in anywhere in India. Candidates must go through the official FCI recruitment notification thoroughly before apply for JE, AG, Steno and Typist post. FCI JE, AG, Steno and Typist job application is collected through Online mode only. 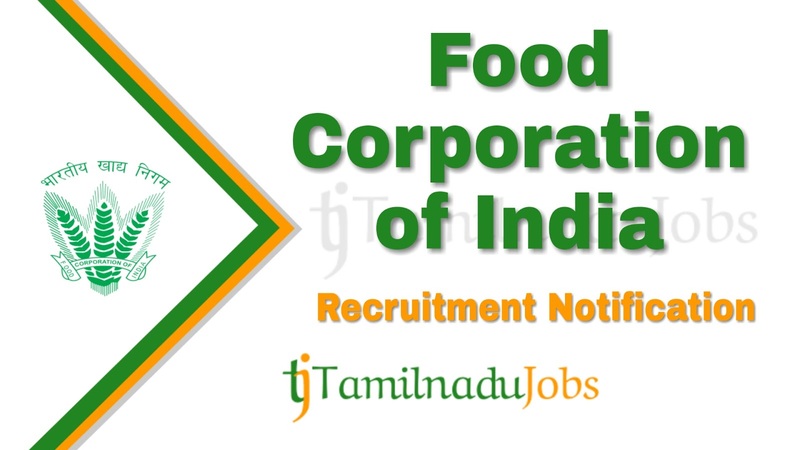 In the recent Recruitment Notification, the following vacancy details given by the Food Corporation of India (FCI) and aspirants should go through the vacancy details and eligibility details for more detail in FCI notification link given below before applying. Aspirants meet the education qualification of Food Corporation of India (FCI) only apply for the JE, AG, Steno and Typist job. FCI notification 2019, education qualification are given below. Steno Graduate along with O‘ level qualification of DOEACC and speed of 40 w.p.m. and 80 w.p.m. in typing and shorthand respectively or Degree in Computer Science/ Computer Application with speed of 40 w.p.m. and 80 w.p.m. in typing and shorthand respectively. AG-II (Hindi) Degree of a recognized University with Hindi as the main subject, Proficiency in English and One year experience of translation from English to Hindi and vice-versa. Desirable is Post graduate qualification in hindi. Typist (Hindi) Graduation or equivalent, 30 W.P.M speed in Hindi Typing and Preference will be given to the candidates knowing bilingual typing (English and Hindi) and Computer knowledge. AG-III (Technical) B.Sc. in Agriculture from a recognized University Or B. Sc. with any of the following subjects from a recognized University: Botany or Zoology or Bio-Technology or Bio-Chemistry or Microbiology or Food Science Or B. Tech or BE in Food Science or Food Science and Technology or Agricultural Engineering or Bio-Technology from a recognized University or an institution approved by AICTE and Proficiency in use of computers. Aspirants who want to apply for FCI JE, AG, Steno and Typist 2019, must attain the following age limits given by Food Corporation of India (FCI). The application fees for Food Corporation of India (FCI) JE, AG, Steno and Typist 2019 differ according to various categories. The application fees details for FCI JE, AG, Steno and Typist given below. Food Corporation of India (FCI) is announced the recruitment for the JE, AG, Steno and Typist to full fill their 4103 posts. Aspirants have to pass the following selection process given by Food Corporation of India (FCI) to get JE, AG, Steno and Typist job. For more detail and correct information check in the official notification of FCI. How to Apply FCI JE, AG, Steno and Typist 2019? Step 3: Fill the details required by FCI in the form. Step 5: Before submitting the application for JE, AG, Steno and Typist, check the details are correct, then press submit and pay the application fee.